This past Saturday, I had the opportunity to kick-off the 2018 wedding season at a brand new venue! Nestled in a quiet neighborhood in historic Quincy sits the timeless Neighborhood Club of Quincy. This was the setting for Tommy and Liz’s wedding reception. At first, I thought I might be lost as I turned into a residential neighborhood in search of a wedding venue, but a few blocks later I found the Club that was true to it’s name. 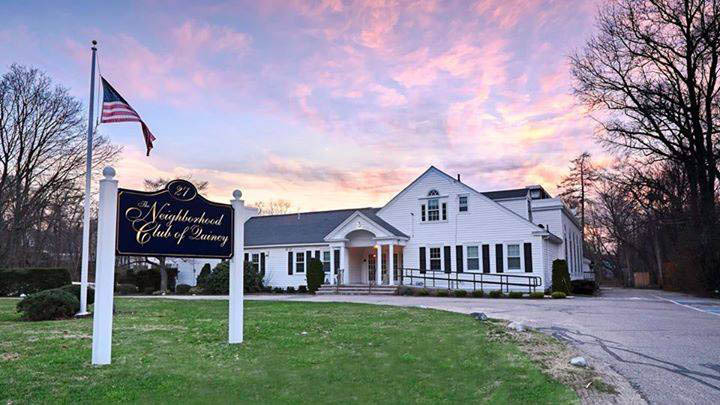 It was established as a social club in 1917 and has evolved into the venue of choice for weddings, social events and corporate functions South of Boston. Per their website, ‘Whether you are looking for a spacious ballroom or a setting for a smaller group of guests, the Neighborhood Club has the perfect place for you to hold party or event.’ From the moment I entered, I couldn’t have agreed more. With it’s vintage decor, the character of the Neighborhood Club is as unique as each event it holds. With five distinct but connected rooms, there’s a perfect fit for every event. I am looking forward to sharing all the great footage from Liz and Tommy’s wedding and the charm that is the Neighborhood Club. In the meantime, check out the Club’s website to learn more at https://www.ncquincy.com. Copyright 2016. videobyjamie.com · All Rights Reserved .